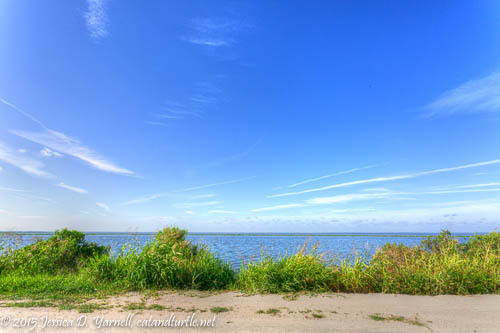 Thanks to my friend Wally, I spent a very pleasant morning along the new Lake Apopka Wildlife Drive a few weekends ago. It was great! An added bonus is that it’s just 20 minutes from my house, making it very convenient. :) As the summer heats up, bird activity starts to decline, so it was great to see all the activity on this eleven mile drive. Here’s what I saw during my 3-4 hour trip. The drive goes through marsh habitat was well as some upland habitat. 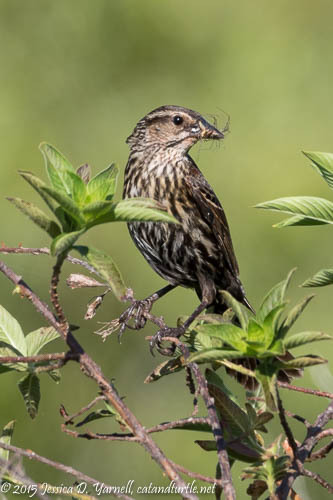 Along the marsh, Red-winged Blackbirds were plentiful. Every tall clump had a male singing on top of it. The females seemed to be busy taking care of their babies. I hoped to see some babies like Wally did, but I had to content myself with seeing the big spider that this female was carrying back to her nest. The nest was hidden in the vegetation, and she didn’t want to let the paparazzi watch the feeding. 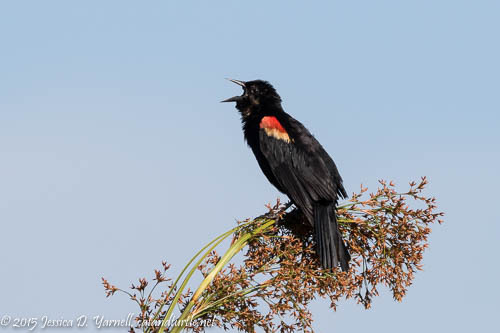 Red-winged Blackbirds are very common, but who says common birds aren’t fun to photograph? I love how the Red-wings spread their wings as they sing. Boat-tailed Grackles were plentiful as well, and I saw many young grackles learning how to hunt for themselves. But it’s so much easier to flap your wings and call for Mom to bring you food! 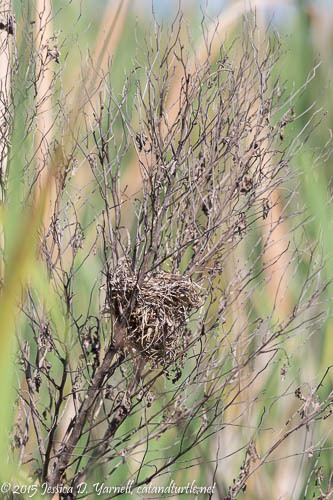 I found tons of nests in the reeds, where those babies were born just weeks ago. 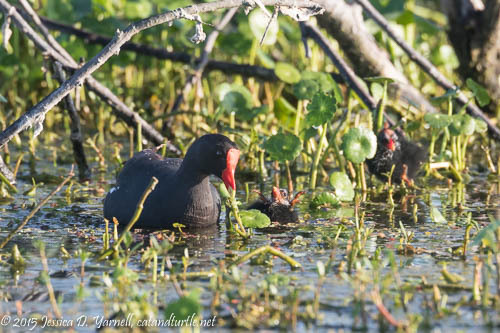 Another common and yet fun bird is the Common Gallinule (formerly known as the Common Moorhen). Their babies are so ugly that they are cute! They look like little aliens. Within a few short weeks, they are juveniles that are pretty much capable of taking care of themselves. Often these older chicks stick around to help Mom raise several more broods of babies as the summer goes on. It’s fun to watch. 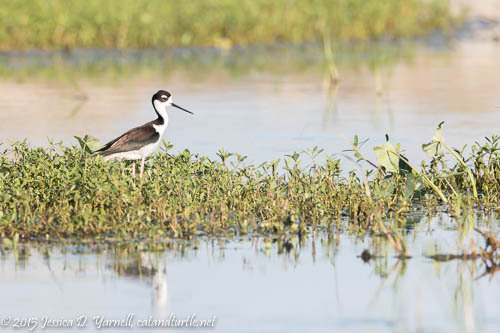 Black-necked Stilts were fairly easy to find, although they were skittish and not so easy to photograph. I used every bit of the Beast’s reach to photograph this one as he went fishing in the early morning light. I’m sure they are nesting nearby, although I didn’t see any nests. 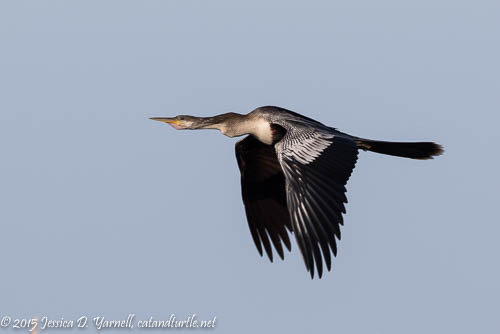 Anhingas were all over the place. This one gave me a great angle as he flew directly into the pretty morning light. The lake shore is pretty. You can drive along the edge for a way. Across the lake, you can see a few buildings in Clermont, but for the most part the lake shore is wild and uninhabited. My best find of the morning was a family of recently-fledged Barn Swallows hanging out in a tree near their nest. The juveniles didn’t seem too steady on the wing yet. They mostly stood in the branches and yelled for Mom to bring in food. This one was very cooperative and didn’t mind having a Beast pointed at him. It’s my first time to see juvenile swallows. I was also surprised to see a Tree Swallow still hanging around. Most of them left already. The sun was already high and the temperatures rising, and I hadn’t made it all the way through the drive yet! I left the rest of it to explore on a future visit. 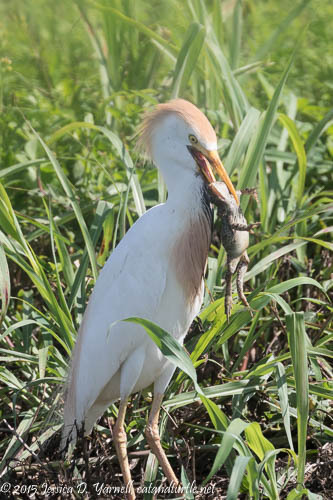 As I left, though, I couldn’t resist stopping to photograph this Cattle Egret, who stood on the side of the roadway with a nice frog in his beak. 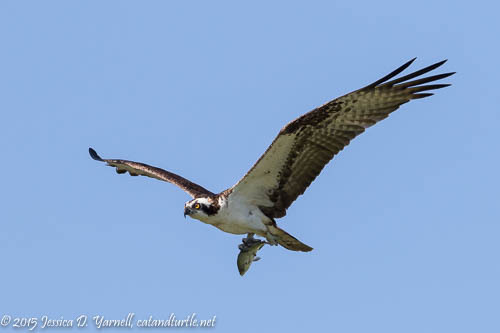 I think his breakfast was easier to catch than it was to swallow! Is that a cool place or what! It wouldn’t take too long if you could just drive straight through, but there are all those birds and bugs and blooms and sky and frogs and — before you know it, it’s time for supper. Wonderful photographs! 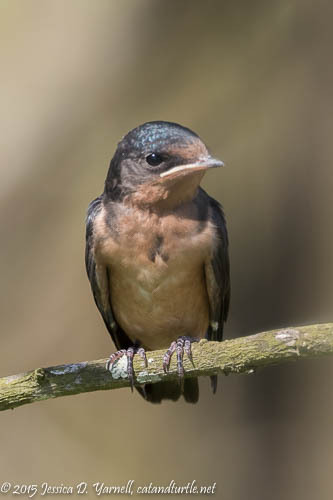 I can’t believe you got a Swallow to sit still on a branch instead of a wire! Haha, I bribed the swallow like you bribed the night heron! No, actually, I think the swallows had just fledged. Their nest was pretty close in the same tree, and this particular bird didn’t seem to have mastered the whole flying thing yet. He was sticking to that branch like glue! That looks like a great place in the cooler months and spring migration. I’ll look forward to checking it out. Congrats on the swallow. Rare to see one in a nice setting for photos. It’s definitely a good place to check out. Maybe the Ani will come back next year!